These guides are invaluable to any aspiring comics artist. Each book offers unique insights and demonstrations of a variety of techniques by experts in the field. 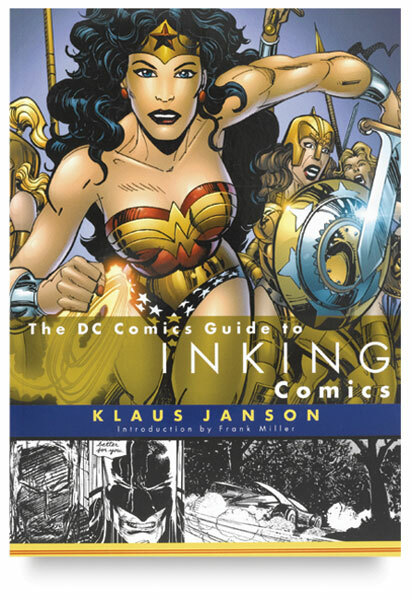 Inking Comics — For the aspiring artist who wants to become an expert comic book inker, this is the definitive resource. Legendary comic book penciler and inker, Klaus Janson, uses world-famous DC characters such as Batman, Superman, and Wonder Woman to demonstrate an array of inking techniques. He covers such essential topics as using textures, varying line weights, creating the illusion of three-dimensionality, and working with light and dark. This book includes an introduction by Frank Miller, one of the most influential comics creators of his generation. It also features 100 black and white illustrations throughout. Pencilling Comics — The art of the legendary Klaus Janson has endured for over 30 years in the ever-changing comic book industry. Covering everything from anatomy to composition to page design, Janson details the methods for creating effective visual communication. Step by step, he analyzes and demonstrates proven strategies for comic book pencilling that are informative and exciting. This book features 100 black and white illustrations. ® DC Comics is a registered trademark.® DC Comics is a registered trademark.